Cridge Park is in the seaside city of Victoria, one of thirteen communities that form the Capital Regional District of British Columbia. Located in downtown Victoria, Cridge Park is 0.20 hectare parkland named in honor of Bishop Edward Cridge, the religious philanthropist who also initiated the Cridge Center for the Family, on Cook Street and Hillside Avenue. Cridge Park is a landscaped parkland with a lawn bowling green and a small treed area. The Canadian Pacific Lawn Bowling Club was formed in nineteen twenty three to meet the recreational needs of the Canadian Pacific Railway and Steamship employees and families. This is a private club that offers its members lawn bowling, bocce and croquet from its location at 730 Belleville Street. The greens are bordered by some beautiful rose bushes. Behind their clubhouse is the treed area of Cridge Park which has a wrought iron picket fence along its southern edge. A sixty meter footpath through the park connects Belleville Street to Humbolt Street. Shaded by London plane, linden, hemlock, cedar and beech trees are several benches and information signs around a lovely native plants garden bed. 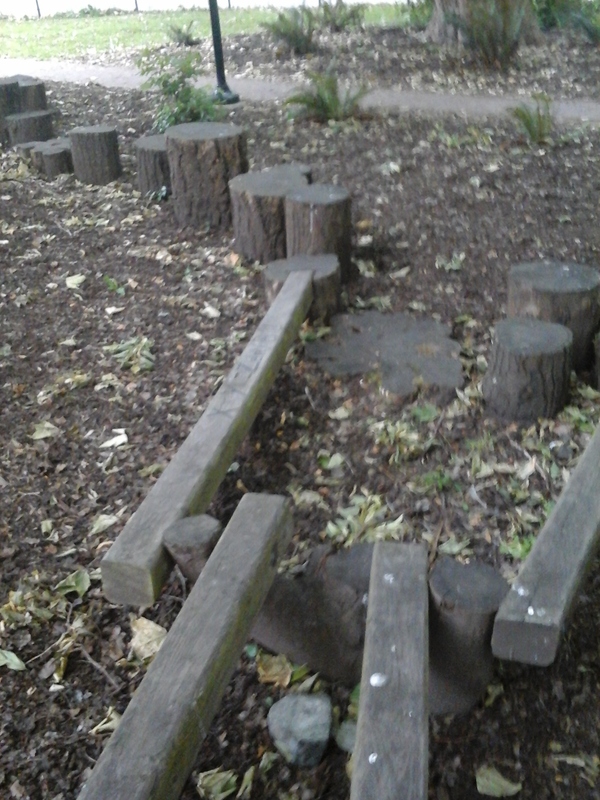 There is also an interesting functional art composed of tree rounds connect by wooden beams. The north eastern border of the park is formed by the community center for Church of Our Lord. The church, located on the corner of Humbolt and Blanchard streets, was founded in eighteen seventy four by Reverend Cridge on the land donated by Sir James Douglas. The Carpenter Gothic styled building was completed in eighteen seventy six. St Ann’s Academy Garden is across Blanchard Street. 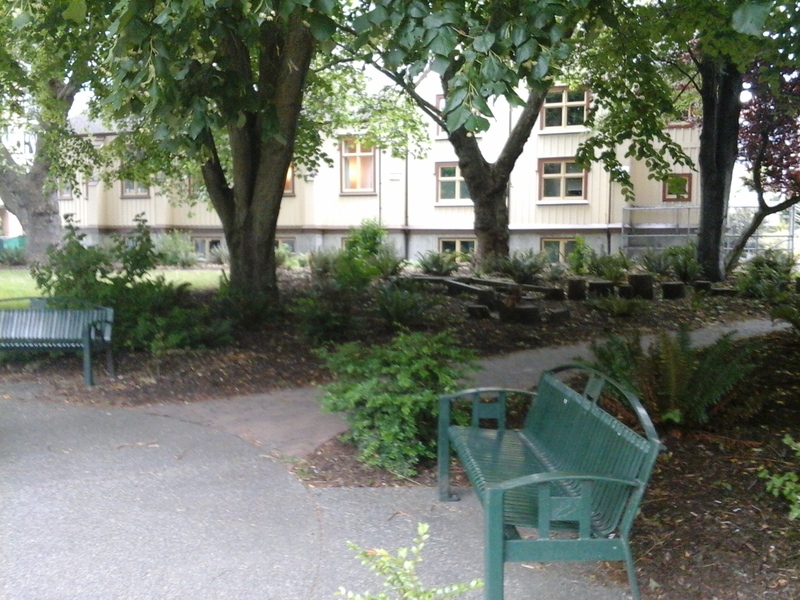 St Joseph’s Hospital Green Space and Mount St. Mary Hospital Garden are a block east along Humbolt Street. Thunderbird Park is a block west along Belleville Street. Beacon Hill Park and South Park are a block south along Blanchard Street. As you might picture, Cridge Park forms park of the greenway in the downtown area of Victoria. This park has a $3M value with its commercial zoning which makes it The Place to explore in your backyard. Cridge Park can be reached from the Trans Canada Highway. Continue along the highway as it becomes Douglas Street. Turn left onto Belleville Street and look for the park on the left. It is located at the corner of Blanchard and Belleville streets where there is no roadside parking. Turn west onto Humbolt Street and look for the small parking area on the left behind the Church of our Lord, otherwise turn east and park along Humbolt Street near St Ann’s Academy. A city bus travels from downtown Victoria past the park.